All eyes are now focused on CWL London, the next Open event of the Black Ops 4 season. With just week to go until the world’s best Call of Duty teams descend on the Copper Box Arena to battle it out for $325K USD in prize money. In this series of articles, we will be looking at each pool and attempting to predict the outcome of each one. Here, we will be taking a look a pool B. 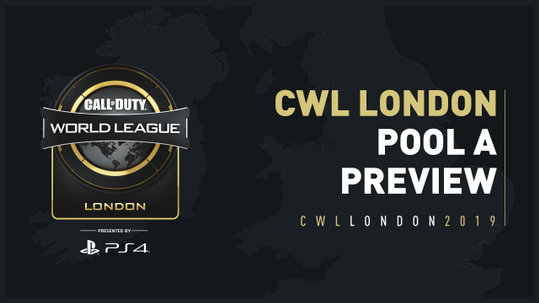 Currently sitting at the top of the CWL Pro League with an impressive 9-2 map record, Gen.G are looking strong heading into London. The addition of breakout player Envoy from Midnight Esports has helped them in terms of slaying but this team still loses the first Hardpoint game on occasion. Nonetheless, this team have an incredibly strong Search and Destroy game and has often been the difference in a close series. Even if they do keep losing game one, game two, three and five are often enough for Gen.G to wrap up the series. Coming into London, they certainly have what it takes to make it into the top four. Coming off the back of a grand final appearance in Fort Worth, it is hard not to consider Splyce a contender for the London championship. 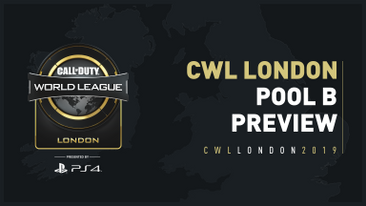 During cross-divisional play, Europe’s king Jurd showed signs of the ruthless aggression that he is synonymous for while Accuracy once again proved why he is one of the strongest ICR players in the CWL. There were a few occasions where Splyce looked a bit shaky during the league but they now have time to regroup ahead of what is set to be a very tricky pool indeed. We’ve already seen this team can make the finals, are they able to go one better and lift the trophy? Amidst of the Rampart controversy, Luminosity are the team to beat after defeating Splyce in the Grand Finals of CWL Fort Worth. Rampart or not, Luminosity still look an extremely strong roster thanks to Gunless and Formal beginning to dominate in their respective roles. If Luminosity are to defend their position at the top, a solid showing from 2016 world champion John will be an essential part of the success of this team. His supreme SMG ability combined with the rest of the team make the North American juggernauts a contender for the championship once again. Rounding out Pool B is a Denial team that has come on leaps and bounds since qualifying for the league last year. The French side have shown real signs of promise in the league, defeating Splyce and pushing OpTic Gaming to a final map in their cross-division match. With many keeping their eyes on the other three teams in pool B, the Wolfpack are able to cause some major upsets in this pool, making it the second group of death. Could they make it out in the top two? There is certainly a chance. Pool B looks nearly impossible to predict. With three extremely talented rosters and a fourth that has shown they can contend with nearly anyone, this particular pool could be anyone’s for the taking at the Copper Box Arena. It will take a lot to take down Luminosity, not an impossibility but I think they will take the top spot comfortably. Which team will take the second place is another matter. If Denial are playing well, they can beat Splyce and Gen.G and spring the surprise. I think Splyce will make it out in second due to their consistency and if Temp can recover from his slight slump in the Pro League, perhaps they can overcome Luminosity and avenge their Fort Worth defeat. Which teams do you see advancing from Pool B? Let us know on Twitter!